December 14, 2014 Games, Software, Strategy & WarXing Interactive B.V.
Go on secret missions and rescue hostages. Stealth Wargaming at its best! Play alone or in co-op mode with another human player and blow up enemy bases, destroy their army and try to make it home in one piece! FPS in 3D isometric perspective. Welcome to Tots’N’Togs ordering page! After ordering to gain access to all the levels and other game features. NOTE: After purchasing the game, you’ll get a special key for register. Please follow the instructions in the registration interface carefully. As soon as people began to reflect on stars, fantastic dreams of space exploration occurred. For a long time people have been dreaming of conquering the whole universe. Now we can do it! We can set a complete monopoly in space! This game is a real boon for those who like to play monopoly. Long-awaited continuation of a big business is finally realized. A monopoly in the real estate is already set long ago. This is not true for space. Space is a quite unmastered area. In this economic strategy You will have to master space on the basis of monopoly laws! Having a small start-up capital and a perfect spaceship, you must conquer the whole galaxy. Rolling dice, the players shift in space according to the number of planets specified. When visiting a planet, they can buy it and build the mighty base there. As soon as Your opponents arrive to Your base, they have to pay you a contribution. Having conquered all planets of the same color, you can set powerful rockets on them which multiply considerably the size of contribution. The purpose is simple: to bring to ruin the opponents and remain the only monopolist in Space. 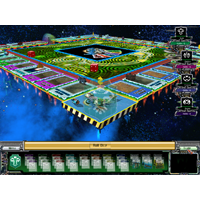 This game looks much like an original monopoly: there are sectors in the game, different events, opponents and even absolutely realistic dice. This game can be played by from one to six players at a time. Note that they can be both human-players and computer-opponents. You can choose the complexity level (beginner, professional) if playing against a computer. Excellent graphics! The game is developed in a 3D space. You manage not a usual wooden chip, but a real spaceship. You can play for one of six races, each having its unique culture and traditions. So put off all Your proceedings for a couple of days, and go ahead, start Your engines! The Dark Legions is a 3d real-time strategy game in the medieval ages. You can command your army and build your empire through story driven missions. Or you can prove your strength against computer players, on randomly generated missions. 18 unique units and 13 buildings, different terrain themes and weather. 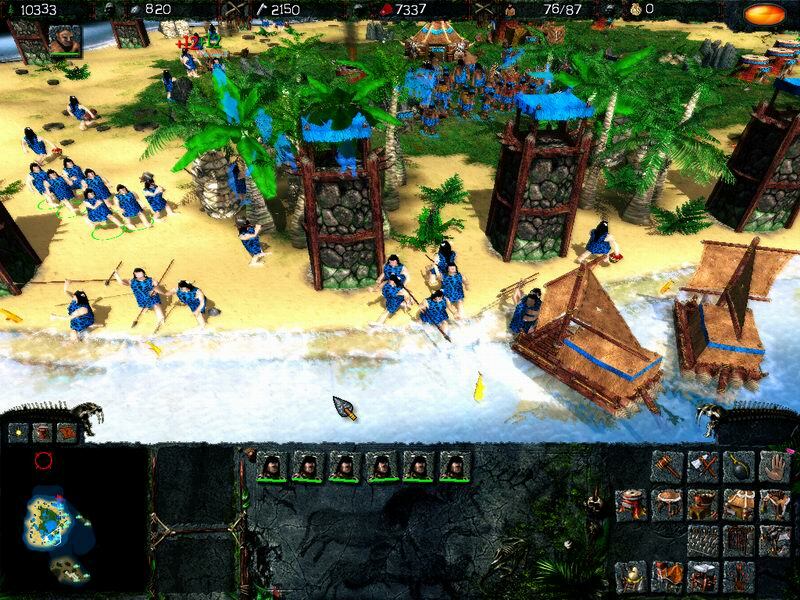 The gameplay is similar to Age of Empires and Warcraft. If you played with them, you won’t have difficulties with this one. Naval turn-based strategy game which covers all major battles on Pacific during WW2. Game contains missions, Death-Match and Free Hunt scenarios & campaigns from Pearl Harbor and Midway to the Iwo Jima and Leyte battle. Scenarios include Hawaii Defence, Coral Sea, Okinawa, Brisbane Convoy, Fall of Australia, Conquer of Japan, Iwo Jima Transport, Imperial Ocean, Great Pacific War and many others. All unit names and officer ranks are historic. Player can purchase new ships/planes during the game. Cruiser, Heavy Fleet Destroyer, Fast Carrier and Heavy Fleet Submarine type. Space turn-based strategy game, WW4 conflict. Game contains missions, death-match and free hunt scenarios & campaigns with more than 60 ship, death-star, stealth, fighter,artillery and radar unit types, and 90 battle technologies. Game objectives: conquer enemy space stations, defend friendly stations, destroy ships, secure transport convoy to the friendly stations. 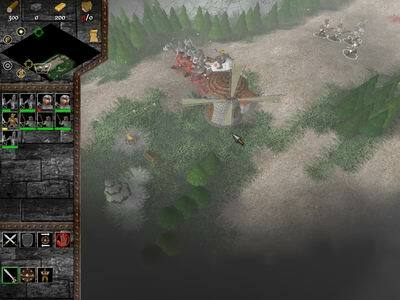 Player can purchase new units and combat technologies during the game. Naval turn-based WW2 strategy game, extension to the classic Battleships game where ships/planes/subs can move. Contains over 60 missions & campaigns and 40 ship, submarine, airplane & port artillery types, with combat maps up to 96X96 large. secure transport convoy to the friendly port. Naval strategy battleship game which covers all major navy battles during WW2. Game contains missions, Death-Match and Free Hunt scenarios & campaign from Pearl Harbor and Midway to the Iwo Jima and Leyte battle. 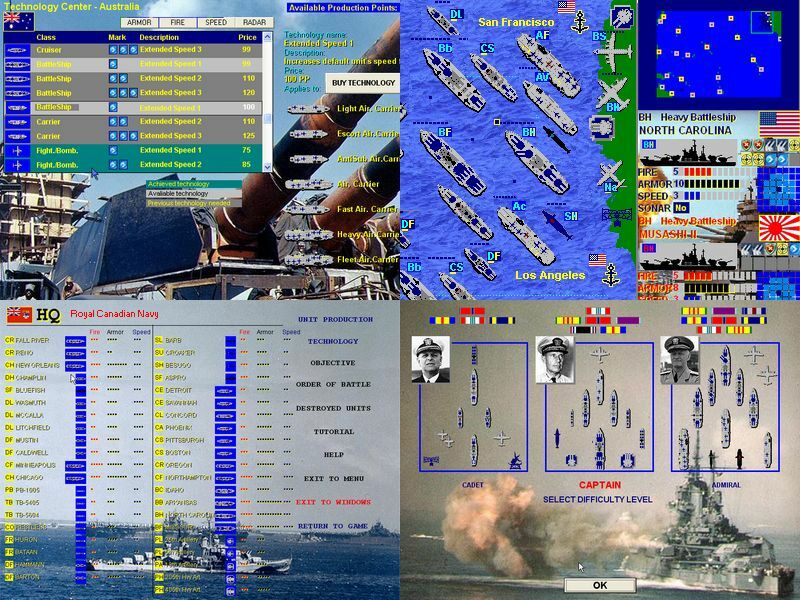 Player can control or fight against USN, Kriegsmarine, Imperial Japan Navy, Royal Navy, Royal Canadian Navy, Royal Australian Navy, Royal New Zealand Navy and Regia Marina (Italian Navy) Scenarios include Bismarck, Atlantic 1941, Lamansh, RAAF, Doenitz, Coral Sea, Midway, HMS Prince Of Wales, Leyte, US Marines, Atlantic 1943, Sir John Tovey, Normandy, Invasion, Emperor Hirohito, HMAS Perth, Road To Okinawa, Singapore, Iwo Jima, Kamikaze, Conquer Of Italy, Norway Convoy, U-Boats, Fall Of Australia, Battle For Leyte, Conquer Of Japan, Yamato, Spruance, Halsey and many others. All unit names and officer ranks are historic. Player can purchase new ships/planes during the game. There are more then 50 unit types, including Battleship, Battlecruiser, Fleet Aircraft Carrier, Heavy Anti-sub Cruiser, Heavy Bomber, Long Range Fighter, Long Range Naval Bomber, Fleet Cruiser, Heavy Fleet Destroyer, Fast Carrier and Heavy Fleet Submarine type. Game objectives: conquer enemy ports, defend friendly ports, destroy ships, eliminate all enemy units, secure transport convoy to the friendly port.